Ack! What Have I Done?! Oh no! How did I get myself into this mess? You’ve probably done the same at one time or another–thought you were safe, just picked a title off the shelf with no prior knowledge of it, right? So you start reading this randomly chosen book, and you find it’s really good, you’re completely engaged, when suddenly you realize–it’s the first in a series, and the second one hasn’t been published yet! I hate it when I do this to myself. Oh well. 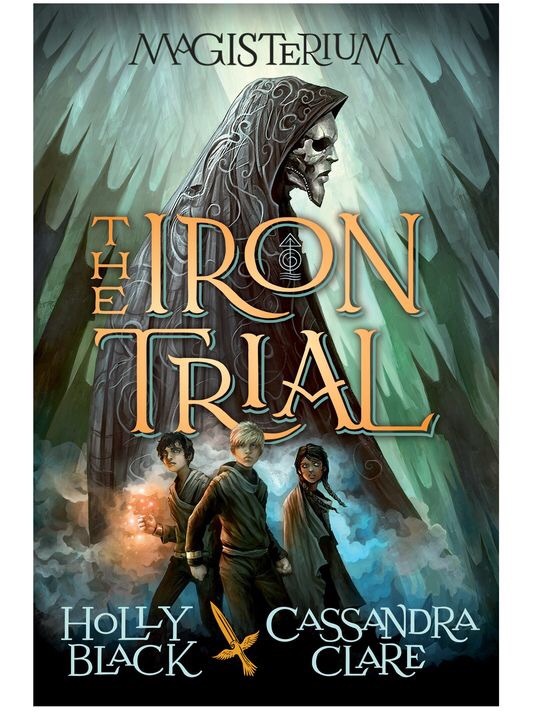 The book in question is called The Iron Trial by Holly Black and Cassandra Clare. I’ve read Black’s Doll Bones and vowed to read more of her work, when this popped up on the shelf in front of me. The basic story is that there’s a magic school (the Magisterium, also the series title) that kids with special talents are going to, and Callum really doesn’t want to go. All the other children treat their selection as a special honor, but not Callum. He tries to fail his entrance test, but they choose him anyway. From as far back as he can remember, Call’s father Alistair has told him that the Magisterium is evil, that it uses children, that the teachers don’t care about the children, and that magic is nothing but trouble. But now that Call is stuck attending the Magisterium (you can’t refuse to go), he finds that he’s enjoying himself. Yes, it’s unpleasant to be underground all the time (think boarding school in caves), and the teachers can be demanding, but the food is really good, and for once he doesn’t stick out as the weird kid (he’s got a permanent limp from a childhood accident). He’s got a talent for using magic, and for the first time ever, he’s making real friends who care about him. This is confusing, and makes him feel disloyal to Alistair, who is still adamantly opposed to the school and trying to find a way to get Callum home. A Prologue hints at why Alistair is so bitterly opposed to the use of magic: as a young mage, Alistair was the one to discover that the Enemy had tricked the Magisterium and its army, so that while their greatest warrior mage waited on the battlefield, the Enemy slaughtered the women and children in the Magisterium’s hideout. The only one left alive was Alistair’s infant son, Callum, and if his wife’s dying message was to be trusted–“kill the child”–he should have died as well. I really enjoyed the complexity of this story, how the sides of good and evil are unclear, and even though it’s about magic, that experience of trying to figure out who to trust in the adult world when you’re a kid is all too familiar. That transition period that you go through when you realize you can’t just rely on your parent(s) to figure out the world for you, it’s an important time. Lucky for Call he’s got real friends now to help him. I look forward to reading the next in the series, which is supposed to be out in the Fall, so I shouldn’t complain, I don’t have to suffer too long, and I’m already on the library’s waiting list for it.